You guys have no idea what is going on around here. 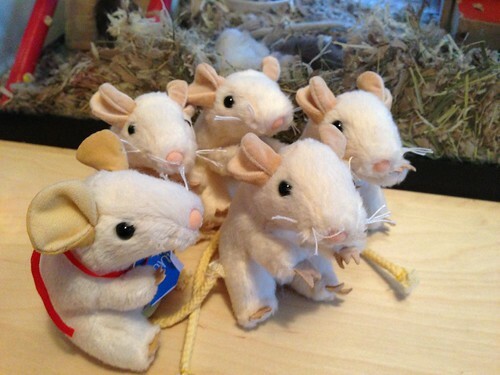 Meet Algernon’s Army: Minnie the Island Mouse, Baggins, Reginald, Demetrius, and Algernon Too. Seriously. How awesome? And this doesn’t even include all the others of you who emailed me to tell me that you wanted to send me a mouse—and those offers mean just as much as an in-the-flesh mouse. I could never have gone out and bought a new Algernon, but getting them from you guys? It feels good. It feels right. And, holy hell, it made my kids so ridiculously happy that I can’t even tell you how grateful I am for you. The munchkins are reluctant to refer to one of these critters as anything other than Algernon, so Algernon Too might have to be the mouse who heads out on adventures first. Trust me though, the rest of them are going to hang out in a place of honor on my desk, because they are not made of stuffing. They are made of love. Oh, and there is another little guy who will be coming later. Sunday got me a mouse too, but he is currently being needed to cheer up her son Sam, who had a tough doctor visit today. Sunday’s kiddo, getting support. Algernon and his army are good that way. Shared with permission. I cannot even tell you how much I loved seeing this photo on Facebook this morning. ALGERNON HELPS PEOPLE, YOU GUYS. 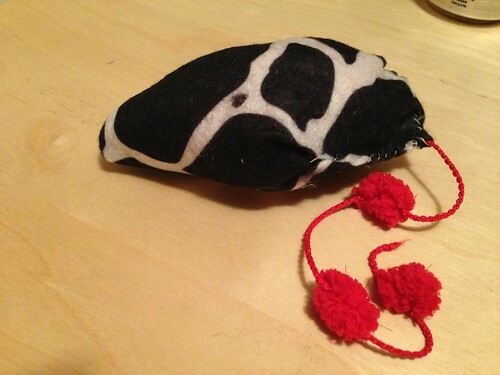 Or rather, Scout, as this mouse is named, because this mouse? Well this mouse is literary, y’all. 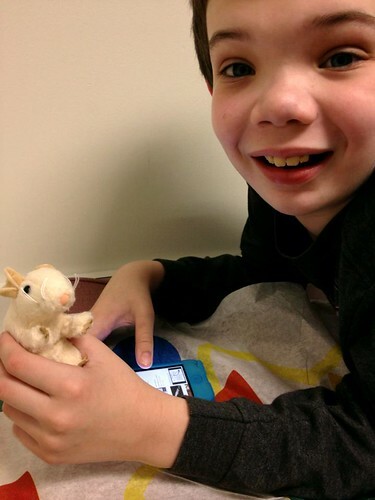 Oh, and just in case things were getting too uniform for you all, Quinn’s occupational therapist worked with Quinn in a session to make a new mousy friend for us, getting his opinion on choices of eyes (NO BUTTONS! NO BUTTONS!) and enlisting his sewing expertise. I love him so much. I will be calling him Giraffey. For obvious reasons. But, you guys, it’s not even my new mousy friends that cheered me up. There was the story one of you told me about losing your own stuffed mouse and finding her under your mom’s porch ten years later. There are, as I think I mentioned, those of you who shared awesome stories of losing your own things, some of which I probably shouldn’t detail here. (You know who you are.) There is the friend who sent a gift card for caffeine, which was much appreciated. 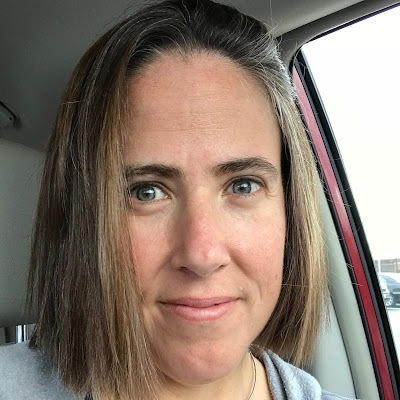 There is my sister-in-law, who was going to give me a winter hat for Christmas, but told me she’ll be moving up that gift hat to replace the one lost and to keep my head warm. There were all of your nice words—and trust me when I say that every one of those words mattered. 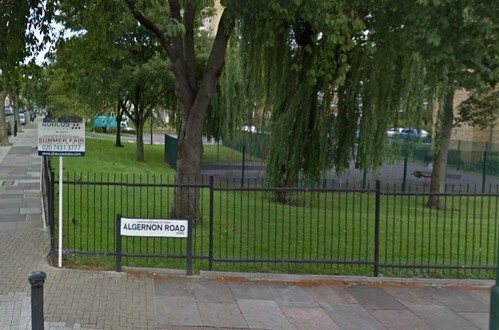 Algernon had international influence, see. None of this, however, can replace Algernon, which you all know, no matter how you responded to his loss. Many of you suggested that Algernon might have a wonderful second life with a new friend. Some of you worked very hard (and successfully) to make me laugh, like one of my very best friends, whom I’ve known since college, who suggested that maybe Algernon’s new life would be a faster one, posed at scenes of his crimes with his new friend, the thief. Maybe, she suggested, Algernon broke bad. In fact, she claims that he’s already been involved in some jewelry store heists. 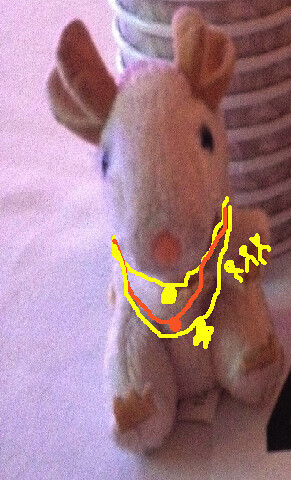 He gots some bling, baby. Whereabouts unknown. You guys, I don’t think Algernon is coming back. He’s got a new adventure ahead of him. This whole episode has really sucked, but I learned something really important. I learned that I have a tremendous number of people who really, really care about me. I learned that love comes in many forms and that I got to experience many of them this past week. I learned that my car thief may have my stuff, but his life is probably not very awesome. I would choose all of you over my stuff any day of the week. That thief brought a black cloud with him, but you all made up a silver lining so thick that it’s hard to even see the storm anymore. Thank you for that. And thank you for my new mice. You made my kids so happy by sending them, which means so much to me. You made me so happy by sending them. I can’t wait to see what adventures my new mouse friends have. Thank you for Algernon’s Army. Thank YOU for BEING Algernon’s army.